Since our world is moving so fast, we must activate and amplify our senses in order to keep pace. Not just our five senses of seeing, hearing, smelling, touching and tasting, but we also need to put our mental senses to work. Our mental “sonar” of listening, intuiting, feeling, and experiencing in real time, enables us to put our relationship awareness into action. Most of us don’t listen well. We are too preoccupied with where we are going and we spend too much time thinking about how we will respond to the person talking to us. By being a good listener, we make a conscious choice to open our ears and stop talking so much. Conscious people listen well. They swipe away backstories and use a clean mental slate, not biases, to listen, learn, and deepen understanding. They ask more questions and make fewer declarations. They walk in other people’s shoes to find fresh ways to solve problems. Their intuition is their greatest tool. Empathy is their secret weapon. Listening from the inside out is critical, for sure. Yet we must also listen from the outside in. In our 24/7 world, connections are everywhere, and the world shows up every moment we turn on our cell phones. The more aware we are of the outside world, the more we can navigate through change. That’s why conscious people understand relationships as well as the environments in which they live and work. For starters, conscious people have a very distinct way of viewing their social spaces. They see their families, organizations, and communities as places of value, and places to create value. The reciprocity of giving and getting is their golden rule. By building trusting relationships, we’re able to learn faster, move farther, and adapt more quickly. So, create value for yourself by making friends with your stakeholders. 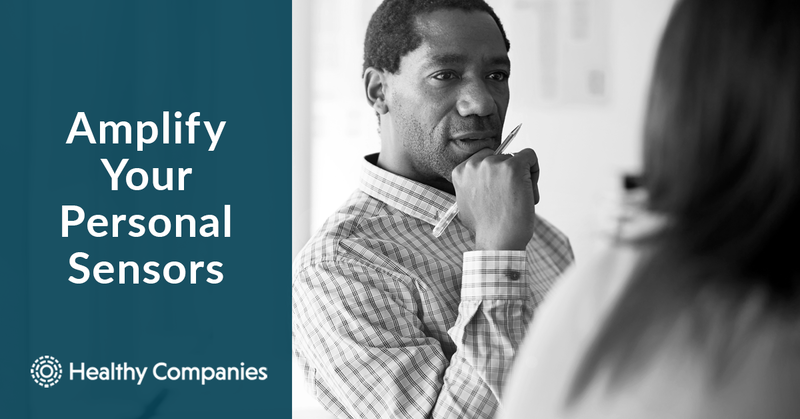 A stakeholder is anyone in your life with an interest in – or concern for – you. Your spouse is a primary stakeholder; so is your boss. Your customers are, both inside and outside of work. Your friends are stakeholders; so is your daughter’s teacher. The CEO of your company is, as are your suppliers. If you are going to be a conscious person, you need to know how your stakeholders think and feel. You need to actively sense what they need and want from you, just as much as you need to tell them what you need and want from them. Part of your responsibility is to make life easier for all of your stakeholders. A tripod is a handy tool to explain life’s balancing act. Kick out one of the legs and your camera will end up on the ground. The same applies to our lives. One leg of the tripod is our work life, another is our family life, and the third leg is our personal life. Our personal sensors need to be fine-tuned to all three to keep us healthy and balanced. Think about your typical day. You arrive at work early to get a jump on your e-mails. Soon people begin to show up at your office with problems and issues that need your immediate input. Next, it’s back-to-back meetings where you stay focused for a couple of hours. Your energy may drag because of jet lag, a bad night’s sleep, or having to work late to handle a crisis. To pump yourself up, you drink a couple of cups of coffee, and maybe go for a walk. Lunch is quick and at your desk. During the afternoon, you may be checking on projects, juggling phone calls and then back in your office to go over figures with your CFO. It’s early evening before you get to go home, no time for stopping at the gym, you attempt to spend some quick quality time with the kids. Off to bed after a quick recap of the day with your spouse. Sound familiar? You marshal an impressive amount of energy propelling yourself both mentally and physically through the myriad demands of being a leader. Energy to handle long days, energy to mentally juggle priorities and tasks, energy to concentrate and think clearly, energy to manage people’s personal issues, energy to focus on your children, and energy to negotiate with your partner about tomorrow’s tasks. If the above sounds like you, your focus is primarily on your work life. The other two legs of the tripod – personal and family – are likely being neglected. Making sure all three legs are sturdy is critical to living a healthy and productive life. It’s inevitable that one of these legs will become vulnerable from time to time – during work stress, marital difficulties, challenges with the kids, or health problems. Then it’s time to rely on the other legs to keep us stable and resilient. Being conscious and aware of this balancing act will alert you to the risk of burnout. Step up, scan your environment, turn on your mental sonar and remember when it’s time to balance the tripod. Becoming more aware of your external environment will help you to amplify your sensors, listen to your stakeholders, and operate with a level tripod. Amplify Your Personal Sensorsis a strategy in the Step Uppractice in our book CONSCIOUS: The Power of Awareness in Business and Life. The other practices are Go Deep, Think Big, and Get Real.